Did you know you could be giving up valuable territory to your competitors? In this article, I will share with you patent essentials that will help you preserve your competitive edge. The Five Minute Patent Boot Camp™ series is a collection of articles, videos, and other material designed specifically for the busy executive, decision maker, or entrepreneur. These articles are designed to help you understand essential concepts so you may more effectively protect product innovations and industrial design. I repeat: patents do not give you the right to make anything. They give you the right to prevent others from making or using your claimed invention. You can use patents to stop your competitors from making or using product innovation and industrial design that is unique and that adds real value for your customers. If your company plays in a crowded field, having a patent does not protect you against infringing on someone else’s patent. However, having a strategically well thought out commercially valuable suite of patents can give you leverage to negotiate or cross-license if you infringe on your competitor’s patents. #2. Disclosing your invention publicly before filing a patent application can have a very bad outcome. The U.S. recently moved to a “first to file” patent system. If you show your invention publicly, you risk competitors copying your ideas and filing their own patent application first. Your only recourse would be a risky and untested procedure in the U.S. Patent Office called a derivation proceeding where you would try to prove that they “derived” their invention from you. If you disclose your invention publicly (Internet, trade show, brochure, etc.) you lose the right to file a patent in most foreign countries. If you disclose your invention publicly or offer a product for sale that includes the invention, you have one year to file a patent application in the United States. Best Practice is to file your patent application before you disclose your invention publicly or offer it for sale. #3. Don’t get burned by the one-year rule. You have one-year to file a U.S. patent application after: (1) publicly disclosing your inventive concept, (2) publicly using it, or (3) offering a product that uses your inventive concept for sale. Public use can include hidden use, for example, hardware or software embedded within a product. Public use can be use in an engineering lab or a factory where access is not restricted. Public disclosure can mean discussing the inventive concept in writing or on the Internet. Your need to be keenly aware of when you disclose your product publicly or offer your product for sale. #4. It’s All About the Claims. The claims can be found at the end of the patent. They are the patent’s legal description. The claims define the patent’s boundaries. The drawings and written description give context to the claims. Ignore the claims at your own peril! The claims are what you are patenting. If you don’t understand the claims, ask your patent attorney or patent agent to explain them to you, phrase by phrase. three or more taper legs projecting downward from the platform. three or more legs projecting directly away from the platform. The first claims requires a back and tapered legs. The second claim only requires a platform and legs of unspecified shape. In general, simpler claims with less descriptive limitations provide for broader coverage. Make it your business to read and understand the claims in your patents. They are not meaningless technical mumbo jumbo. Patent claims precisely define the boundaries of your invention. Utility patents protect unique structures and processes. Design patents protect unique industrial design or appearance. Each serves a different purpose but can work together to create a formidable moat of protection around your products. Utility patents generally have a broader range of protection than design patents because they are conceptually based. Design patents are based on literal appearance. However, all things being equal, the law allows for potentially greater monetary damages from design patents. A suite of well-executed design patents can be very valuable. Particularly if your company differentiates itself for your competition by appearance and style. Much of Apple’s billon dollar judgment against Samsung was for design patents. 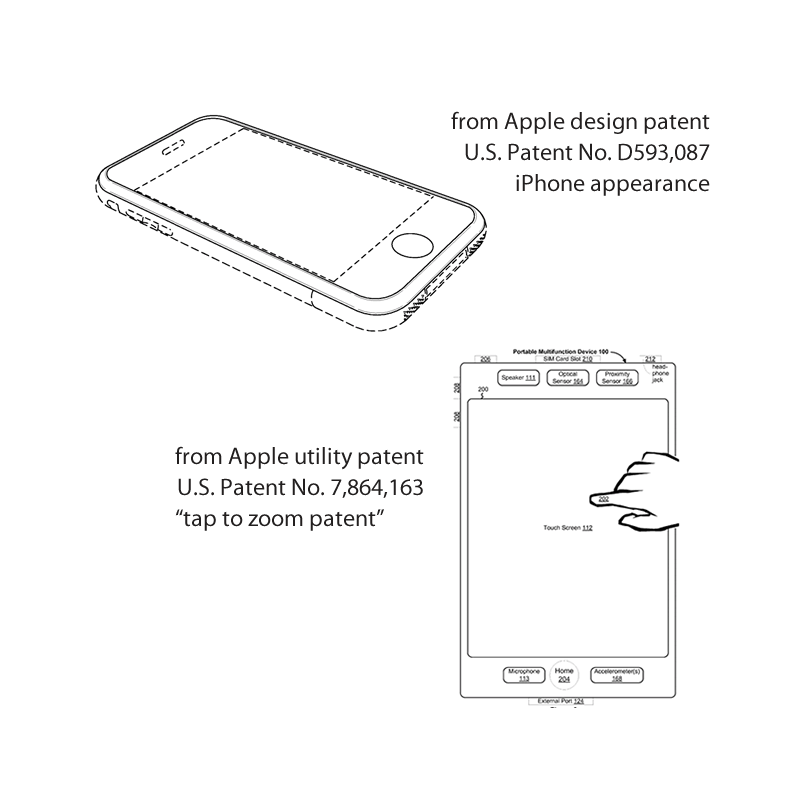 Design patents that are not well thought out can be commercially useless. A provisional patent application is only good for what it discloses. This means that any new ideas or new material added to a later written non-provisional patent application does not get the benefit of the filing date of the provisional patent application. Writing an effective provisional patent application is open almost as much work as writing a non-provisional patent application. On the other hand, a poorly written provisional patent application can have little or no value and creates a false sense of security. Since provisional applications are not examined, you are delaying the time it takes for you to secure patent rights and to prevent your competitors from using your valuable ideas. never enough time to do it right, always enough time to do it over. With this in mind, why not take the time to do it right in the first place? File a non-provisional application upfront. I hope you enjoyed this Five Minute Patent Boot Camp™ article. I am hoping that in this short time, you were able to get a greater understanding and appreciation of essential patent concepts. Interested in more information? Please feel free to browse other articles on the Stone Creek website.